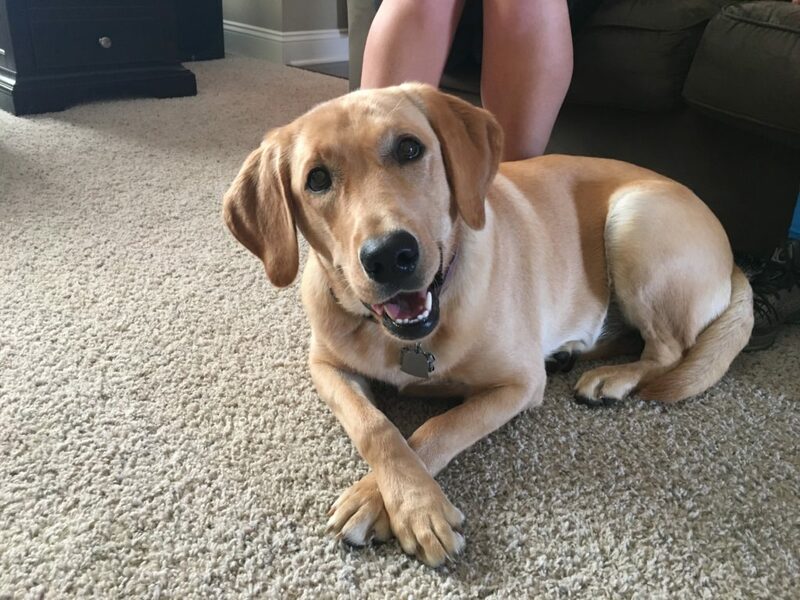 Piper is an eleven-month-old female Labrador Retriever who lives in Omaha. Her guardians set up a puppy training session with me to stop her from engaging in several unwanted behaviors; chewing things, jumping up, only listening to the family’s father, pulling on the leash, running away and a fear of loud noises. Piper showed some territorial behaviors when I arrived to the session. Nothing too extreme, but enough to indicate that she felt that it was her job to handle security for the home. This is often an indicator of a dog who it thinks it has more authority than it actually does in relation to the humans they live with. Whenever you have a dog that is reacting to someone who is arriving at your home and you pull the dog away from the door physically, this often intensifies the dog’s reaction to the human. A better way to deal with the situation is to communicate to the dog that it needs to keep away from the door on its own. I had the father of the family head outside to play the part of an arriving guests so that I could demonstrate this technique myself. Because my timing was instant and the intensity of my disagreement was appropriate, Piper responded to it right away. Its always great when an excited dog starts to develop some good dog obedience. The problem is, I’m not going to be at the home in the future so the guardians need to know how to do this themselves. We reset the exercise and this time the family’s mother was the one to answer the door. While piper’s guardian was able to achieve success eventually, her reactions were way too slow and the intensity of them were so low that the dog did not recognize or respect them. As the mother continues to practice this exercise, her technique and timing should improve which should have an impact on the dog’s response as well. I sat down with the members of the family to discuss a few new ways of communicating with their dog. As I noted in the introductory video, the guardians were inadvertently communicating the exact opposite of what they intended when they were interacting with their dog. I suggested that the family members start practicing my Petting with a purpose philosophy. This involves only petting the dog if it follows a command such as sit or lay down if it nudges for attention. We also want to make sure that we reward the dog anytime it engages in a sit, come or down position on its own. The reward needs to be provided within three seconds in order for the dog to connect to the reward with the actual behavior. Next I went over some nonverbal communication cues that the family can use to disagree with the dogs or move them away from anything that they are not supposed to be interacting with. After arming the family with these new communication tools, I had the mother and one of the children get up and go to the kitchen so they could come back and claim their personal space. Just like the door answering exercise, it’s going to take a little bit of time and practice before the members of the family have the confidence in their technique to have really good timing. But once they do, they will be able to more effectively communicate what they do and do not want from their dogs in a way their dogs understand and respect. I often look for ways to incorporate structure and discipline into a routine activities. A great example of this is teaching the dog to sit and wait as the human ascends or descends a set of stairs. To dogs, whoever is in front is literally in the leadership position. So by asking Piper to sit and wait while the humans go up or down the stairs first, we can help her adopt more of a follower’s mindset. By the end of the session, Piper was showing respect for people’s personal space, was sitting to ask for attention and following commands the first time. It’s going to take practice and consistency and all the members of the family have to be on the same page, otherwise the dog will resist and try to go back to the way that it was. But if everyone starts to enforce these new rules, boundaries and limits with immediate timing, pets the dog with a purpose, and practices the exercises until they are proficient at them, Piper’s days of ignoring them and engaging in mischievous behavior will diminish and eventually stop completely.